For a country approximately the size of New Jersey, Israel certainly garners its share of widespread international attention. It is scrutinized, dissected, and more often than not, demonized under the microscope of the global media. In spite of volatile relations with its neighbors, Israel has maintained a deeply entrenched bond with the United States since President Truman became the first world leader to recognize its existence in 1948. This “special relationship” has not come without costs. U.S. ratings in the Arab world have continued to spiral downward, and the lingering Israeli-Palestinian peace process, whose resolution continues to elude domestic and international efforts, continues to be the dominant source of strain. Can the United States improve its standing in the Arab and Muslim world while maintaining its strategic, political, and moral ties with Israel? In recognizing the interconnectedness between these relationships, this paper takes a “bilateral” approach to these elusive questions by examining President Obama’s outreach to the Arab world during the early years of his presidency through his key speeches, his administration’s relationship with Israel during this period, and where the U.S. currently stands in the region. President Obama certainly had his work cut out for him when he took office in January 2009: Regional median approval of U.S. leadership was just 15% in the predominantly Muslim Middle East and North Africa. A history already replete with strained relations in the region had been exacerbated by the two unpopular wars, a controversial detention facility in Guantanamo Bay, and the continuation of the Arab-Israeli conflict in which the Arab nations continually view the U.S. favoring Israel in its approach. President Obama did, however, have options that would lead to more immediate upticks in ratings: in a January 2009 Foreign Policy Opinion Briefing, Gallup polling of various North African and Middle Eastern countries (including the Palestinian territories) showed pulling out of Iraq and closing the Guantanamo Bay as the factors most likely to improve those countries’ views of the U.S. On the other hand, the complexities of the United States’ deeply embedded relationship with Israel, as well as its involvement in the Israeli-Palestinian peace process, have continually been a source of tension and conflict between the three parties and would require more creative and sustained efforts to increase Arab approval ratings while maintaining the relationship with Israel. So in this season of new beginnings I would like to speak clearly to Iran's leaders. We seek instead engagement that is honest and grounded in mutual respect (…) I want you, the people and leaders of Iran, to understand the future that we seek. It's a future with renewed exchanges among our people, and greater opportunities for partnership and commerce. It's a future where the old divisions are overcome, where you and all of your neighbors and the wider world can live in greater security and greater peace (…) You have that right -- but it comes with real responsibilities, and that place cannot be reached through terror or arms, but rather through peaceful actions that demonstrate the true greatness of the Iranian people and civilization. Recognizing our common humanity is only the beginning of our task. Words alone cannot meet the needs of our people. These needs will be met only if we act boldly in the years ahead; and if we understand that the challenges we face are shared, and our failure to meet them will hurt us all. It is based upon cultural and historical ties, and the recognition that the aspiration for a Jewish homeland is rooted in a tragic history that cannot be denied (...) Six million Jews were killed – more than the entire Jewish population of Israel today. Denying that fact is baseless, ignorant, and hateful. Threatening Israel with destruction – or repeating vile stereotypes about Jews – is deeply wrong, and only serves to evoke in the minds of Israelis this most painful of memories while preventing the peace that the people of this region deserve. Israelis must acknowledge that just as Israel's right to exist cannot be denied, neither can Palestine's. The United States does not accept the legitimacy of continued Israeli settlements. This construction violates previous agreements and undermines efforts to achieve peace. It is time for these settlements to stop. The language Obama used when referring to Israeli settlements- denying their legitimacy- sparked much debate, and has continued to affect U.S. policy towards Israel and the peace process, this chapter will later elaborate on the aftermath of these statements. It also warranted a prompt Israeli reply, delivered by Netanyahu three days later to a joint session of Congress. Barnea, Nahum. “Inside the Talks’ Failure: US Officials Open Up.” Ynet Magazine, May 5, 2014. http://www.ynetnews.com/articles/0,7340,L-4515821,00.html. Beinart, Peter. "Why Obama Will Ignore Israel." Newsweek. December 17, 2012: 22. Biography in Context. Birnbaum, Ben, and Amir Tibon. “How the Israel-Palestine Peace Deal Died.” New Republic. July 20, 2014. http://www.newrepublic.com/article/118751/how-israel-palestine-peace-deal-died. Bruck, Connie. “Friends of Israel.” The New Yorker. September 1, 2014 issue. http://www.newyorker.com/magazine/2014/09/01/friends-israel. Cavari Amnon, and Elan Nyer. “From Bipartisanship to Dysergia: Trends in Congressional Actions Toward Israel.” Israel Studies 19, no. 3 (Fall 2014): pp. 1-28. JSTOR. JPost.com staff. “Full Text of PM Binyamin Netanyahu’s Speech to US Congress.” The Jerusalem Post. May 24, 2011. http://www.jpost.com/Diplomacy-and-Politics/Text-of-PM-Binyamin-Netanyahus-speech-to-the-US-Congress. Judis, John B. “Ending the Israeli-Palestinian Conflict is No Longer a Vital American Interest.” The New Republic. August 10, 2014. http://www.newrepublic.com/article/119022/2014-gaza-war-why-obama-and-kerry-have-failed-end-it. Leibler, Isi. “Candidly Speaking: the Obama Administration’s Unprecedented Outburst Against Israel.” The Jerusalem Post. 10/07/2014. http://www.jpost.com/landedpages/print article.aspx?id=378371. Netanyahu, Benjamin. “Prime Minister Benjamin Netanyahu’s Speech at the United Nations General Assembly.” The Prime Minister’s Office. September 29, 2014. http://www.un.org/en/ga/69/meetings/gadebate/pdf/IL_en.pdf. Obama Barack. “President Obama at the 2011 AIPAC Policy Conference.” Speech, Walter E. Washington Convention Center, Washington, DC, May 22, 2011. Obama, Barack. “Remarks by President Obama to the Turkish Parliament.” Speech. April 6 2009. www.whitehouse.gov. Obama Barack. “Remarks by the President on the Middle East and North Africa.” Speech, State Department, Washington, DC, May 19, 2011. http://www.whitehouse.gov/the-press-office/2011/05/19/remarks-president-middle-east-and-north-africa%20. Obama Barack. 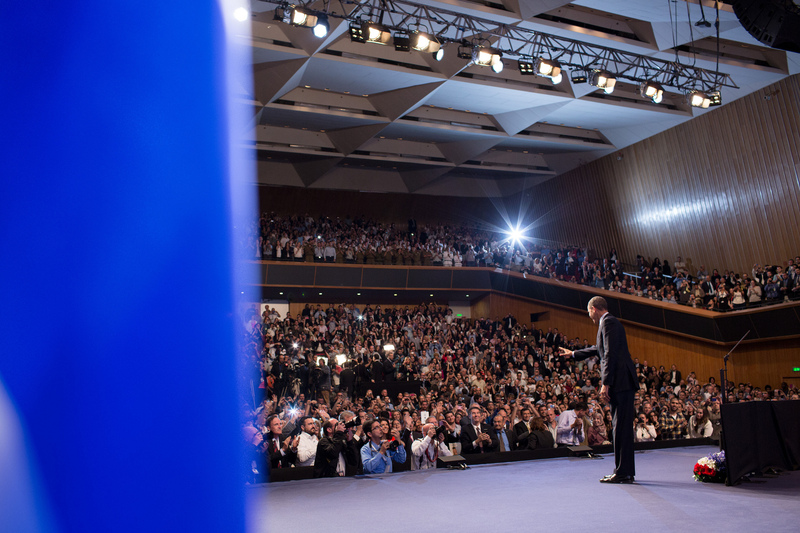 “Remarks of President Obama to the People of Israel.” Speech, Jerusalem International Convention Center, Jerusalem, Israel, March 21, 2013. The White House Office of the Press Secretary. http://www.whitehouse.gov/the-press-office/2013/03/21/remarks-president-barack-obama-people-israel. Obama Barack. “Remarks by President Obama to the United Nations General Assembly.” Speech, United Nations General Assembly Hall, New York City, New York, September 24, 2014. http://www.whitehouse.gov/the-press-office/2014/09/24/remarks-president-obama-address-united-nations-general-assembly. Rhode David. “How John Kerry Could End Up Outdoing Hillary Clinton.” The Atlantic. November 20, 2013. http://www.theatlantic.com/magazine/archive/2013/12/ johnkerry-will-not-be-denied/354688/?single_page=true. Spetalick, Matt. “Amid Differences, Israel’s Netanyahu to seek reassurances from Obama on Iran.” October 1, 2014. http://www.reuters.com/article/2014/10/01/us-usa-israel-idUSKCN0HQ2YY20141001. Waxman, Dov. “ The Real Problem in U.S.-Israeli Relations.” The Washington Quarterly 35 no. 2 (Spring 2012): pp. 71-87. Center for Strategic International Studies. Zogby, James. “Arab Attitudes, 2011.” Arab American Institute Foundation. http://b.3cdn.net/aai/3c5edf53ed2f56e799_5qm6ba4r9.pdf. _____. “Despite Their Wide Differences, Many Israelis and Palestinians Want Bigger Role for Obama in Resolving Conflict.” Pew Research Global Attitudes Project: May 09, 2013.http://ww.pewglobal.org/2013/05/09/despite-their-wide-differences-many-israelis-and-palestiians-want-bigger-role-for-obama-in-resolving-conflict/. _____. “Five Years After the Cairo Speech: How Arabs View President Obama and America.” The Arab American Institute. 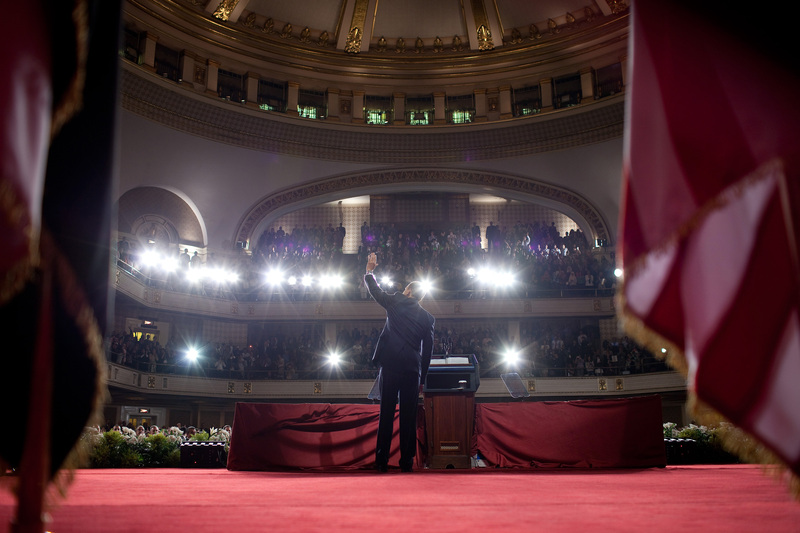 2014. http://www.aaiusa.org/reports/5-years-after-the-cairo-speech-how-arabs-view-president-obama-and-america. _____. “Hamas Covenant 1988.” Yale Law School Lillian Goldman Law Library. http://avalon.law.yale.edu/20th_century/hamas.asp. _____. “Is Peace Possible?” The Arab American Institute. 2012. http://www.aaiusa.org/reports/is-peace-possible. _____.“Jihad in Jerusalem,” The Wall Street Journal, November 18, 2014. http://online.wsj.com. _____. “Our Mission.” AIPAC. http://www.aipac.org/about/mission. 1.) Barack Obama, “Remarks by the President in Celebration of Nowruz,” March 9, 2009, www.whitehouse.gov. 2.) Barack Obama, “Text: Obama’s Speech in Cairo,” Speech, The New York Times, June 4, 2009, www.nytimes.com. 3.) Barack Obama, op cit. 4.) Barack Obama, op cit. 5.) Barack Obama, “Remarks by President Obama to the Turkish Parliament,” Speech, April 6, 2009, www.whitehouse.gov. 7.) Martin Indyk, op cit., pp. 119. 9.) Barack Obama, “President Obama at the 2011 AIPAC Policy Conference,” Speech, Walter E. Washington Convention Center, Washington, DC, May 22, 2011. 10.) Dov Waxman, “The Real Problem in U.S.-Israeli Relations,” The Washington Quarterly 35 no. 2 (Spring 2012): pp. 71-87, Center for Strategic International Studies. 11.) JPost.com staff, “Full Text of PM Binyamin Netanyahu’s Speech to US Congress,” The Jerusalem Post. May 24, 2011. http://www.jpost.com/. 12.) Benjamin Netanyahu, “Prime Minister Benjamin Netanyahu’s Speech at the United Nations General Assembly,” The Prime Minister’s Office, September 29, 2014. http://www.un.org/en/ga/69/meetings/gadebate/pdf/IL_en.pdf. 13.) Barack Obama, “Remarks by President Obama in Address to the United Nations General Assembly,” Speech, United Nations General Assembly Hall, New York City, New York, September 24, 2014, http://www.whitehouse.gov/the-press-office/2014/09/24/remarks-president-obama-address-united-nations-general-assembly. 14.) Matt Spetalnick, “Amid differences, Israel's Netanyahu to seek reassurances from Obama on Iran,” October 1, 2014, www.reuters.com. 17.) Barack Obama, op cit. 18.) “Is Peace Possible?” The Arab American Institute, 2012, http://www.aaiusa.org/reports/is-peace-possible. 19.) Benjamin Netanyahu, “Full text of Netanyahu’s foreign policy speech at Bar Ilan,” Haaretz, Speech, June 14, 2009, www.haaretz.com. 20.) Benjamin Netanyahu, op cit. 21.) “Is Peace Possible?” op cit. 22.) Barack Obama, “Remarks by the President on the Middle East and North Africa,” Speech, May 19, 2011, www.whitehouse.gov. 24.) David Rhode, “How John Kerry Could End Up Outdoing Hillary Clinton,” The Atlantic, Noveber 20, 2013. http://www.theatlantic.com. 25.) Yale Law School: The Avalon Project, “Hamas Covenant 1988,” http://avalon.law.yale.edu /20th_century/ hamas.asp. 26.) John B. Judis, “Ending the Israeli-Palestinian Conflict is No Longer a Vital American Interest,” The New Republic, August 10, 2014, http://www.newrepublic.com/article/119022/2014-gaza-war-why-obama-and-kerry-have-failed-end-it. 27.) Peter Beinart, "Why Obama Will Ignore Israel," Newsweek, December 17, 2012: 22, Biography in Context. 28.) David Rhode, op cit. 29.) Nahum Barnea, “Inside the Talks’ Failure: US Officials Open Up,” Ynet Magazine, May 5, 2014, http://www.ynetnews.com/articles/0,7340,L-4515821,00.html. 30.) Barack Obama, op cit. 31.) Dov Waxman, “The Real Problem in U.S.-Israeli Relations,” The Washington Quarterly 35 no. 2 (Spring 2012): pp. 77, Center for Strategic International Studies. 32.) John B. Judis, “Ending the Israeli-Palestinian Conflict is No Longer a Vital US Interest,” The New Republic. 33.) Ben Birnbaum and Amir Tibon, “How the Israel-Palestine Peace Deal Died,” New Republic, www.newrepublic.com. 34.) “Our Mission,” AIPAC, http://www.aipac.org/about/mission. 35.) Connie Bruck, “Friends of Israel,” The New Yorker, September 1, 2014 issue, www.newyorker.com. 37.) Barack Obama, “President Obama at 2011 AIPAC Policy Conference,” Speech, May 22, 2011. 39.) Amnon Cavari and Elan Nyer, “From Bipartisanship to Dysergia: Trends in Congressional Actions Toward Israel,” pp. 20. 40.) Amnon Cavari and Elan Nyer, ibib, pp. 20. 42.) Dov Waxman, op cit., pp. 73. 43.) “Despite Their Wide Differences, Many Israelis and Palestinians Want Bigger Role for Obama in Resolving Conflict.” Pew Research Global Attitudes Project: May 09, 2013, http://ww.pewglobal.org. 44.) “Presidential Approval Ratings—Barack Obama,” Gallup, http://www.gallup.com/poll/. 45.) Pew Research Global Attitudes Project, op cit. 46.) “Five Years After the Cairo Speech: How Arabs View President Obama and America,” The Arab American Institute, 2014, http://www.aaiusa.org/. 48.) Martin Indyk, op cit., pp. 139. 49.) Ben Birnbaum and Amir Tibon, op cit. 50.) Barack Obama, op cit. Alexandra M. Quinn graduated in 2014 with a Bachelors degree in Political Science International Affairs from Northeastern University in Boston, MA.